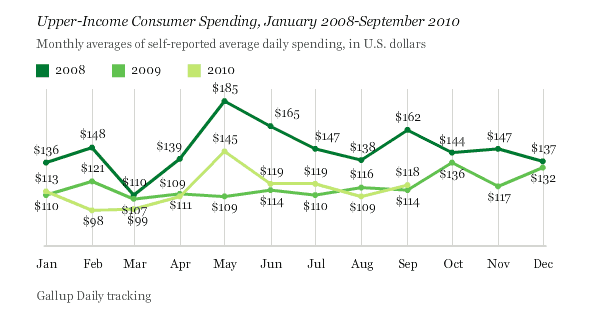 Lower- and middle-income Americans' self-reported average daily spending in stores, restaurants, gas stations, and online averaged $48 per day during September -- down $6 from August and $16 from July. 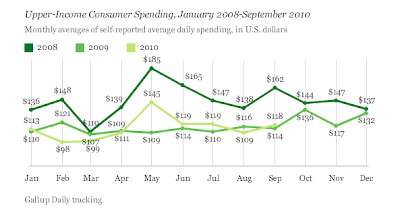 Consumer discretionary spending by these Americans making less than $90,000 a year is now at its lowest level since Gallup began daily tracking in January 2008, as the recession was just getting underway. 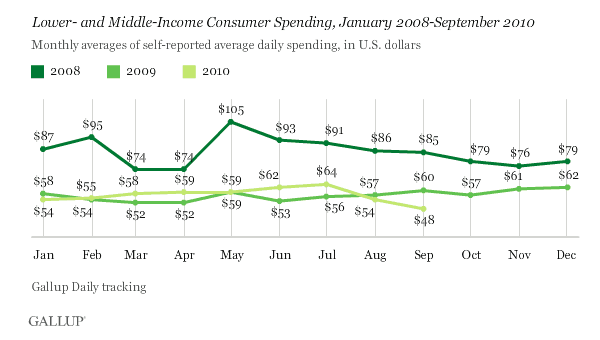 Upper-income Americans reported spending an average of $118 per day in September -- up $9 from August but virtually the same as they spent in June and July. Spending among this group making $90,000 or more annually is not much different from the $114 they spent in September 2009. 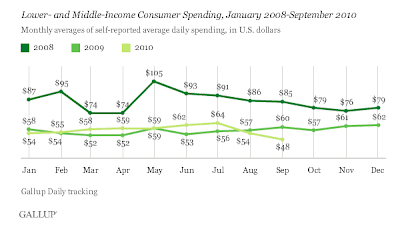 Only once -- in May -- has 2010 upper-income spending exceeded the 2009 "new normal" upper-income spending range of $107 to $121 per day. Gallup modeling suggests that lower- and middle-income spending is significantly more sensitive to job market conditions than is upper-income spending. In this regard, the September decline in lower- and middle-income spending may reflect the sharp increase in unemployment over the same period and continued high underemployment levels. Further, the lagged effects of continuing high and increasing unemployment are probably yet to be fully felt. On the other hand, upper-income spending tends to be more responsive to the "wealth effects" associated with higher stock and commodities prices. Although upper-income spending hasn't been increasing in response to the best September on Wall Street in 71 years -- at least to this point -- upper-income Americans have maintained their spending, while that of other Americans has declined. Given this context, the recent Federal Reserve discussions about another round of quantitative easing seem to make a lot of sense. The Fed needs to do everything it can to keep the U.S. economy from experiencing another decline in economic activity -- a so-called double-dip. While it is not clear that this Fed effort will help the overall economy in the immediate term, anticipation of it has Wall Street surging and the dollar plummeting. In theory, the resulting wealth gains could have the beneficial effect of increasing upper-income spending. Regardless, Gallup's September spending and jobs data suggest that the possibility of a double-dip is no longer negligible. Congress needs to show the same sense of urgency as the Fed concerning what it can do for jobs and the economy when it convenes in its planned lame-duck session after the midterm elections. There is no merit in Quantitative Easing. The last thing we need is another stock market bubble just to keep upper income groups spending. Moreover, QE has given support to commodity prices even though it has done nothing, nor will it do anything for prices received by small businesses for their goods and services. Gallup, like the Fed, ignores the other side QE. Forcing interest rates low damages those on fixed income barely scraping by on 0% interest in there savings accounts and CDs. Every month I report on NFIB small business trends and every month it looks like a broken record. October is no different. Please consider NFIB Small Business Trends for October. Inflation? Not a threat. Far more owners have cut prices than raised them for 21 months in a row. Deflation? It certainly feels that way to a quarter of the owners reporting price declines for the goods and services they produce and sell, and apparently a majority at the Federal Reserve are now worried. New “inflation targets” are being floated out there, like two percent (characterized as price stability?). This will be the justification for more “quantitative easing”. Buying more Treasury securities may push rates even lower, but to what end? The impact on home sales will surely be minimal. With mortgage rates at record low levels already, even lower rates are unlikely to invite new entrants to the market. Of course, there may be other “agendas” such as a weakening of the dollar and support for asset prices. This is very dangerous as hundreds of billions of dollars are being “allocated” based on false prices (interest rates). The charade can’t be maintained forever and weakening the dollar only invites others to join the party. And lost in all of this focus on credit is the loss of hundreds of billions in interest rate income for savers. Certainly their spending has been curtailed as a result. Every dollar a borrower saves from some sort of refinance deal is a dollar of interest income lost to savers. Even lenders will lose income as loans with interval rate re-sets will be set based on historically very low Treasury rates (lowering net interest margins). No wonder confidence is low and uncertainty is high, it is hard to make sense of this. Gallup's modeling of trends is highly likely to be correct, but its support for QE is misguided as the more detailed analysis by the NFIB shows.